The timing couldn’t be more perfect. The sun has just set on the fourth season of Downton Abbey® (the finale aired last weekend), and this weekend on March 1, the widely anticipated exhibition Costumes of Downton Abbey will open here in the Galleries at Winterthur. Co-curators Jeff Groff, Maggie Lidz, and Chris Strand invite you to celebrate the costumes seen on the world-acclaimed fictional series and compare the British lifestyle on the show with real-life on the American Winterthur estate. I recently popped into the exhibition for a sneak peek as the final touches are being tended to before tomorrow’s opening. 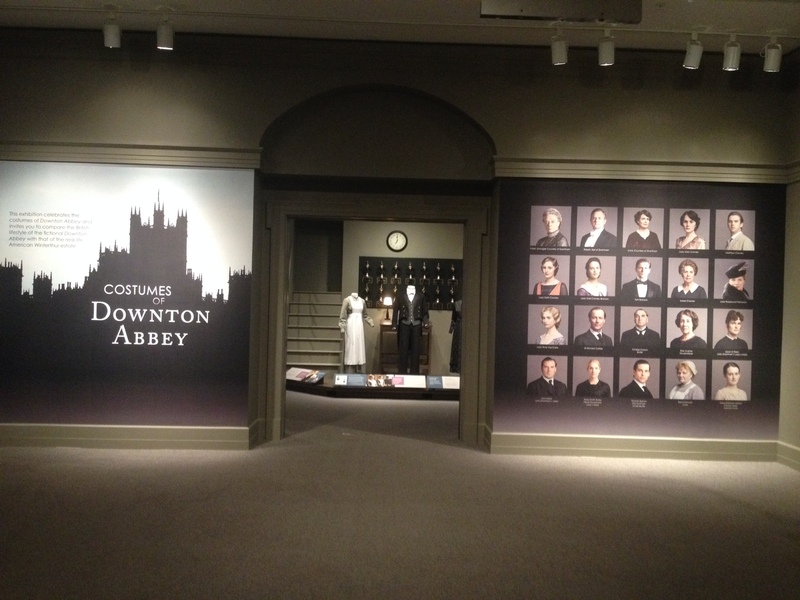 As you enter the Galleries, the right wall outlines 20 characters seen upstairs and downstairs on Downton Abbey, along with a guideline of the character’s costumes on display. The exhibition is divided into three main themes, each focusing on the time of day the costumes were worn—early morning, daytime, and evening. Dialogue from the series is seen throughout the exhibition, along with video and stills to help tell the story of the Crawley family and their servants. To whet your appetite, I’ll give you a taste of the costumes worn in the morning and the customs that occur on the estate at that time. The first British and American comparison observed in the exhibition is the difference in manners between British and American servants. In Great Britain, proper manners were instilled in family members. There was no need for books on etiquette or on training and managing staff; servants were trained by servants, and skills passed from generation to generation. Americans, however, needed books such as Emily Post’s or publications such as Vogue to guide etiquette. In the United States, the word servant was considered unacceptable. H. F. du Pont preferred the use of terms “help” or “staff.” Another difference between Winterthur and a similar house in Great Britain was the variety of nationalities, religions, and races among employees here. Staff at Winterthur was organized traditionally; Winterthur founder, Henry Francis du Pont oversaw the men, and his wife Ruth Wales du Pont the women. There are also opportunities throughout the exhibition to see objects from the Winterthur collection that were used during the du Ponts’ residence at Winterthur. Breakfast cards and the electric bell system by Edward’s & Company of Norwalk, Connecticut, are some such collection pieces displayed within the morning section of the exhibition. The bell system illustrates how wealthy Americans were more interested than the British in new technology and installing the latest labor-saving devices in their homes . Costumes of Downton Abbey has a little something for everyone. For fans of the series Downton Abbey, this exhibition is an exciting chance to see the forty costumes worn by the beloved characters up close. It is also a chance to see how costumes designed for television vary from everyday life to make fabrics and textures translate on screen. Says co-curator Maggie Lidz, “Our hope with this exhibition is that we can offer visitors a way to further enjoy one of their favorite television shows.” Even visitors who are not avid fans of Downton Abbey will enjoy the beauty of the costumes and the fascinating comparisons between the fictional Downton Abbey and Winterthur. Don’t miss the next installment, which details the costumes worn during daytime by the upstairs and downstairs characters on Downton Abbey. Costumes of Downton Abbey opens March 1 in the Winterthur Galleries. For more information, please visit winterthur.org/downtonabbey. Blog contributed by Hilary Seitz, Marketing Communications Department. This entry was posted in Exhibitions and tagged Carnival, Chris Strand, Cosprop, Costumes of Downton, Costumes of Downton Abbey, Costumes of Downton Abbey Exhibition, Downton, Downton Abbey, Downton Abbey Exhibition, Downton Exhibition, Jeff Groff, Maggie Lidz, Masterpiece, PBS, Winterthur, Winterthur Exhibition, Winterthur Galleries, Winterthur Museum, Winterthur Museum Garden & Library. Bookmark the permalink. I will be coming to Winterthur this summer with my two adult children who are big fans of the show, can’t wait. I am interested in finding out HOW the exhibit got to Winterthur. Who got the idea, how is was arranged, if it will travel somewhere else after. If someone knows, please answer. Thanks so much for your interest in the ‘Costumes of Downton Abbey’ exhibition here at Winterthur! Our previous blog post by one of the exhibition’s curators Maggie Lidz talks about how the exhibition came about, starting with an idea from Winterthur Director Dr. Roselle, a fan of the Downton Abbey television series. Here is the link: http://museumblog.winterthur.org/2014/01/30/costumes-of-downton-abbey-at-winterthur-in-the-making/. Also, to answer your question the Winterthur exhibition is not traveling as it not only showcases the beautiful historically inspired costumes worn on the television series, but also examines the comparisons and differences of the fictional program and real life at Winterthur. 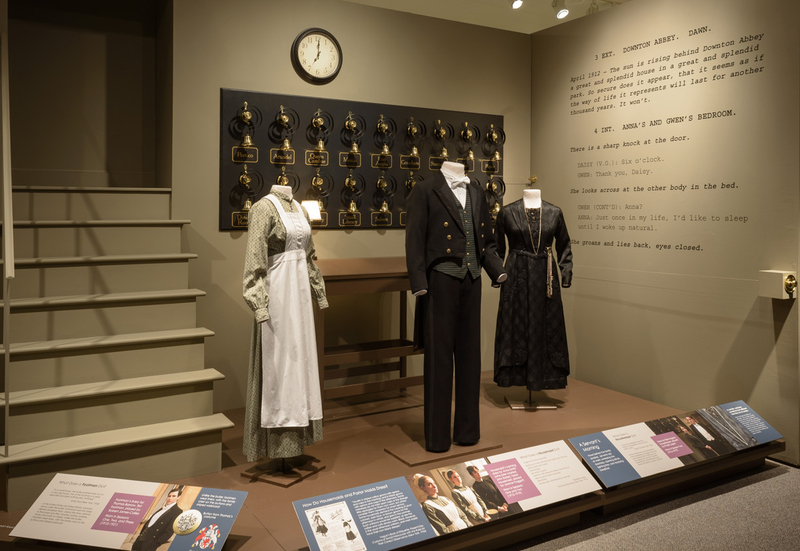 Costumes of Downton Abbey is on view at Winterthur through January 5. Please let us know if you have any more questions. Thanks!